Looking for a cheap and easy tropical escape? Then put Sabah, Borneo on your list of places to visit! I was in need of a winter escape but didn’t have the funds to head to Europe. After a quick “Skyscanner fly anywhere” search, I discovered that Sabah, Borneo was close, cheap and could soothe my adventurous spirit. This is my easy Sabah, Borneo itinerary for 2 weeks while on a budget, packing in as much adventure as I possibly could. Travel Tip: Check out the roundabouts! Every one has a sculpture in the centre that represents the area around. Thanks to Vanessa from The Island Drum for giving me the heads up about these! Before We Go Any Further, Some Background Information – is Sabah, Borneo Safe? I always say you should know your own limits and safety requirements. I found Sabah, Borneo to be perfectly safe and easy. However, there is a safety warning from the Australian government and other countries on a small part of the region. This is due to pirate activity coming out of the Philippines. The pirates have been known to abduct local fisherman and ransom them back. There have only been a few cases involving tourists, and none recently. I suggest doing your own research into the area to determine if you would feel safe. Please note, that this security warning does NOT cover all of Sabah, only the part closest to the Philippines, which just happens to be the main diving area of Semporna. It’s a big island so there is still a lot to do if you decide to stay away from the warning area. From my perspective, I booked before doing research into it being safe, then completely freaked out when I saw the travel warnings were in an area that I wanted to go to. I spent two nights frantically reading every TripAdvisor post and blog on the subject and walked away with a very conflicted view. In the end, I decided to keep my original itinerary and head to that region. At no point did I feel unsafe. At no point would I have been concerned about an abduction, in fact, considering the huge military presence in the area I have no idea how pirates would abduct a tourist. If you were to ask me if you should still go there? I would say yes, but with the caveat that you do your own research into the risks. Because Sabah, Borneo is so diverse and has so many exciting things to do. I drew up a list of my “must experience” items and then worked my itinerary to meet them. Sabah, Borneo is a fantastic place to do some really cool adventurous things. In relation to budget, I had decided that I didn’t want to spend more than $2500 AUD for the whole trip. 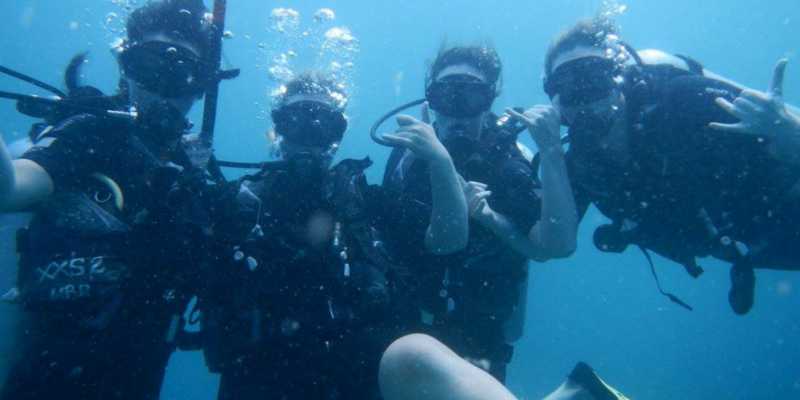 It ended up costing closer to $3000 AUD because I kept adding in extra days of diving that I hadn’t planned on. Travelling during Hari Raya put the prices up considerably, so I recommend doing some research into when this is on and avoiding it. Though it was awesome to see all of the Hari Raya festivities! 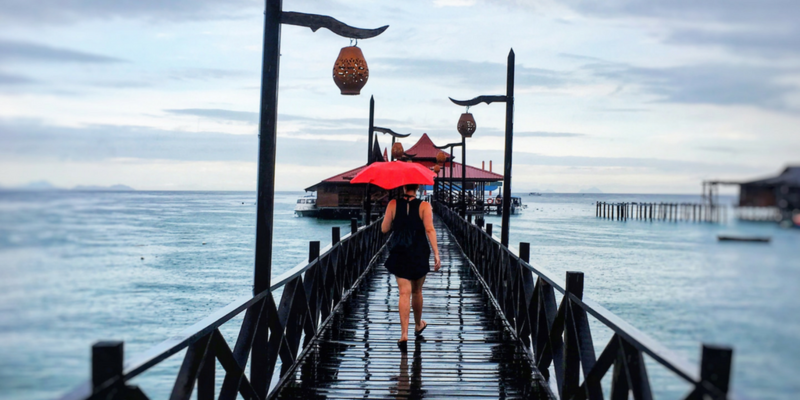 So… Here is My Sabah, Borneo Itinerary for 2 Weeks on a Budget! 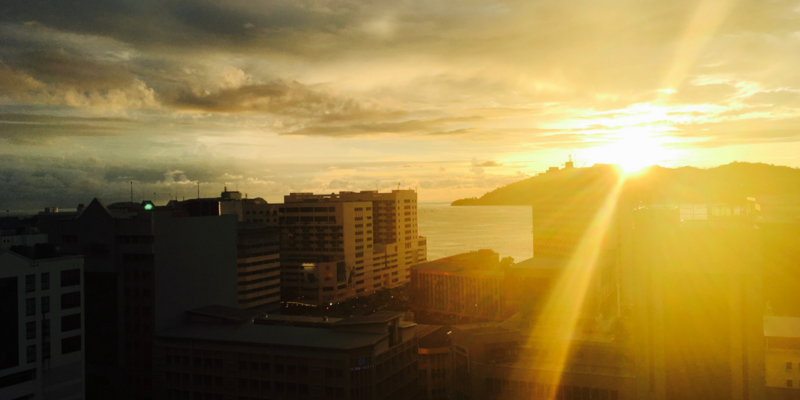 What to do and see in Kota Kinabalu, Sabah, Borneo. Walk through the markets down near the waterfront. I particularly enjoyed seeing all of the alteration shops set up out on the street. Visit the wetlands nature park, go early in the morning or late in the afternoon to actually see some wildlife. The most I saw in the middle of the day was mud crabs… but I did see A LOT of them. Head up to Signal Hill Observatory to watch the sunset. You can either walk up or catch an uber. I recommend getting there early as it is a popular spot. Also, head to the City Mosque and the Sabah State Mosque’s, both of which are stunning buildings that dominate the city skyline. Where to eat in Kota Kinabalu, Sabah, Borneo. My number one pick is the fisherman’s village Night Markets. There is a huge variety for a great price. There are also lots of vegetarian options as well. Another popular restaurant is Welcome Seafood – the seafood is amazing. Get in early as otherwise all of the good stuff is gone as everything is fresh, so once it is gone… it’s gone! Other tidbits about Kota Kinabalu, Sabah, Borneo. 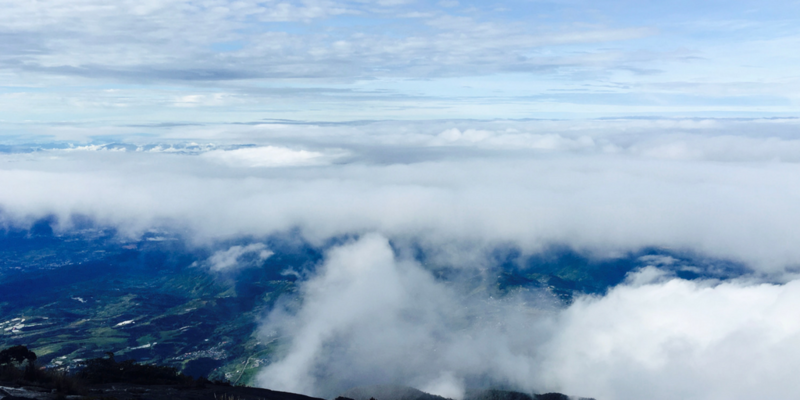 This is a great time to get anything you might have forgotten for your hike up Mt Kinabalu. Things like head torches, band-aids and gloves. I stayed at Faloe Hostel, which was a little out of the town centre… but not so far that we couldn’t easily walk in. It was a small and intimate hostel with great amenities and extras. The owners were there most of the time and were extremely helpful in organising tours and things on the other side of the island. Cooking class time! Using ingredients from the jungle to make a delicious lunch. Massive thanks to @toppeaktravelborneo for a fantastic day. A cooking class is a fantastic way to get to know the local culture and cuisine. I recommend doing the Taste of Borneo Cooking Class, it includes a market tour and several dishes. The hosts were very accommodating for vegetarian and allergies. It was held in the hosts home, which gave us a unique insight into the local community we couldn’t get otherwise. My favourite dish was one of the vegetarian options: green ferns in garlic and chilli. Who knew you could eat ferns?! Travel Tip: If you are concerned about altitude sickness, head up to the park the night before and stay in one of the hotels close by (there are loads). This will help you acclimatise ahead of the hike. Kota Kinabalu is considered one of the best hikes in the region. 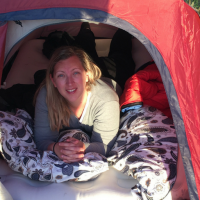 You hike for a full day up the side of the mountain, camp overnight on cabins precariously balanced on a cliff face, get up at 2 am to climb to the summit just in time for sunrise. It is epic, it is hard, it is spectacular. If you are an adventurous person I strongly recommend it. In fact, I recommend it even if you are an everyday person like me – here are some tips to help you survive and thrive. It was one of the hardest things I have ever done, but I don’t regret doing it, I just wish I had been able to acclimatise to the altitude better. This is a big day if you stayed in Kota Kinabalu the night before your hike. I strongly recommend packing some snacks to have on the bus ride on the way up to the mountain… because your next chance to eat won’t be until you have climbed halfway. 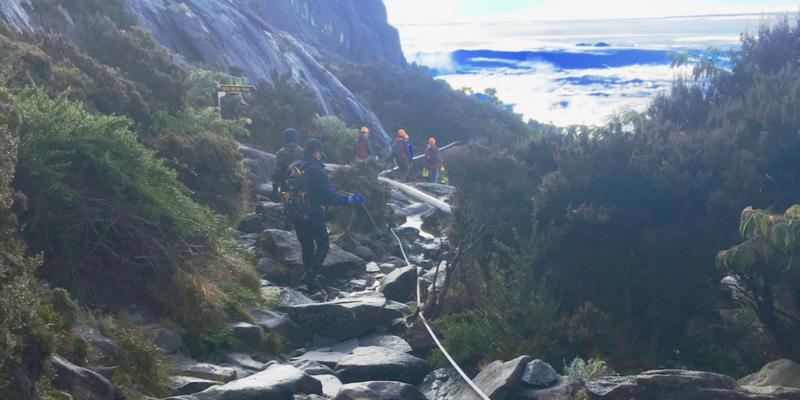 After you have had breakfast at the top of Mt Kinabalu you then have the gruelling task of coming back down. Going up is mentally hard. Going down is physically hard. Be careful of your knees and don’t rush. Also, it is easy to forget to stay hydrated on your way down, but the more water you drink the lighter your pack is, so guzzle away. My suggestion is to stay at one of the hotels near the park that night. I pitied all of the climbers who had to get on a bus for a two-hour ride back to Kota Kinabalu. There are plenty of options, from eco-lodges to backpacker motels. Staying up in the highlands means you can relax a lot sooner. Just remember to stretch – otherwise, you won’t be able to walk the next day. 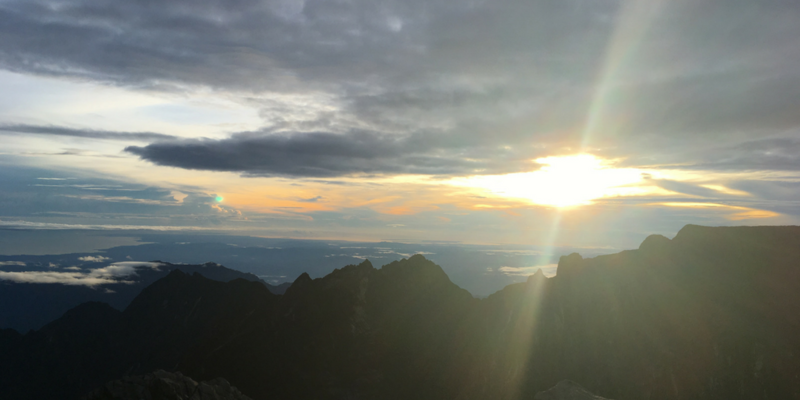 It is ok to have a rest day, especially after you have climbed something as huge as Mt Kinabalu. In my original itinerary I didn’t plan for a rest day… after climbing Mt Kinabalu, I juggled things around to have one. Therefore, I recommend you schedule one in. Get up late, stretch and relax. We hired a driver to take us to the local hot springs. The drive to the hot springs was one of my favourite parts of the trip as it was through stunning countryside framed by mountains. It had an ethereal feel, and my exhausted body and mind drank in the beauty as though it was a red bull. The springs themselves were a letdown… because of expectations. We had expected natural pools, or at lease man-made pools on the side of a natural pool. What it was, in reality, was a series of giant bathtubs that you turned the taps on the access the spring water. The water was amazing and definitely helped to soothe my body. If I had known what it was like beforehand, I don’t think I would have been disappointed and I still would have gone. So, this is me telling you – expect a bunch of concrete bathtubs that you add water into. But the water is amazing and so worth it! Grab an afternoon bus to Sepilok. These run through the area from Kota Kinabalu every hour. Some buses are packed… so be prepared to crowd on. There is a bus stop right out the front of the Mt Kinabalu park, so head back there to grab the bus. You just need to flag it down and pay the driver. You can ask your accommodation to call the company to let them know that you are there… but it won’t make much difference if the bus is packed you will be sitting in the aisle. If you are staying in Sepilok, the bus driver can drop you off at the turn to Sepilok… however it is about a 20-minute walk to the accommodation from there, which you may not want to do if it is raining. I recommend staying at the Sepilok Forest Lodge Resort. It’s close to the attractions, in a serene environment, and has an amazing menu! The Orangutan Rehabilitation Centre in Sepilok is a fantastic way to see these magnificent creatures up close and personal. The centre rescues baby orangutans’ from the circus’, markets or people who keep them as pets and then rehabilitate them to survive on their own. When they are first released into the wild they often stay quite close to the centre, where they can still get food easily (as it is left out for them). After a while, they grow wilder and head off in search of their own territory. Logging and palm oil is a huge problem for the orangutan’s as it is slowly destroying their natural habitat. Centres like this, help to protect a small portion of their environment, but it is a huge problem, do your part by refusing to buy products with palm oil in them if you can. There are strict feeding times, one in the morning and one in the afternoon. You can only access the centre at this time, the rest of the time it is closed to protect the animals. There are rules about being silent and not using flash photography – very sensible, please adhere to these while you are there to avoid startling the wild animals. I saw at least 7 different orangutans’, I also stayed until all of the big tour groups had left which meant that one of the big males who was a little shyer came out. He ended up walking on the railing where we were standing so we got to see him up close, quite amazing! The Sun Bear Sanctuary is pretty awesome but not as great as the orangutan sanctuary. The viewing platforms are above the bears so you are looking down on them while they are squabbling over pieces of coconut. 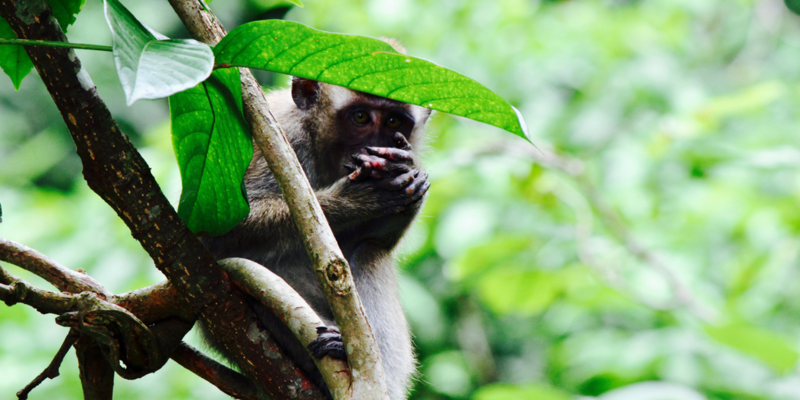 I was actually more entertained by the monkeys who were trying to steal their food… and the tourist backpacks. The staff and volunteers here were extremely helpful and chatting with us for a long time about the bears. I learnt a lot! Turtle Island is the epitome of what I consider “adventurous activity”. It starts by going on a small boat to a secluded tropical island, which limits the number of visitors allowed per day. There are snorkelling, beach walks and heartbreaking beautiful sunsets. It ends with watching mother turtles lay their eggs and baby turtles hatch out and run to the water. For 24 hours you are trapped on a paradise island with nothing to do but take in nature and the environment. When it was time to leave, I felt like a whole new person. For more detailed information on Turtle Island, see my full blog review. You should return from Turtle Island by mid-morning. If you weren’t able to go to the Orangutan Rehabilitation Centre earlier, you could do it this afternoon. However, I suggest taking some time out to sit by the pool and chill out. If chilling isn’t your thing – there are jungle walks in the area. Some include waterfalls and while, others climb more mountains. Getting from Sepilok to Semporna is a full day bus ride. Pack snacks and a book. We caught the bus from the roundabout at the Sepilok turn off. We asked our hotel to make a booking for us and to let the bus company know we would be there. I had considered staying in Semporna for longer than one night. However, as soon as I arrived I was glad it was just the one night. It is a rough city with not much happening. It took us a long time to find somewhere to eat when we arrived as everything was shut. Mabul island is the launch pad for diving the Sipidan reef, but it also has a number of fantastic dive spots just off its shore. The island is a much better place to stay than Semporna. However, it isn’t the paradise that Turtle island is. The human impact on this island is a little heartbreaking. There is no rubbish disposal system for the local fishing village, so what they can’t burn ends up in the water. It is a problem that they will need to address soon to maintain the tourist trade that keeps the island alive. In saying that, it is still very beautiful and the people are wonderful. 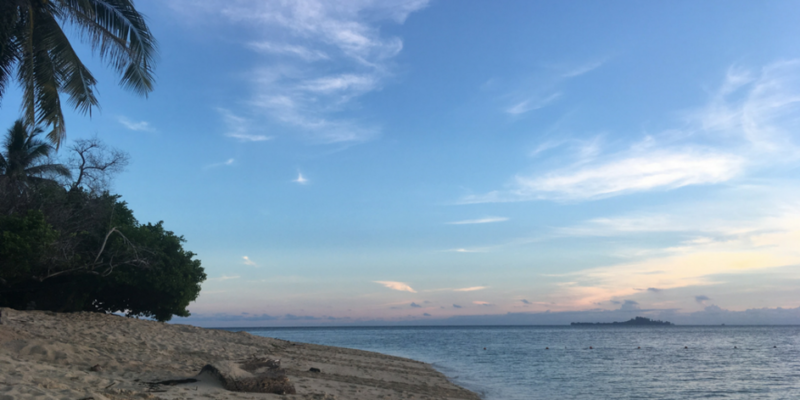 If you are planning on staying on the island of Mabul, which I highly recommend, a transfer to the island is often included in your dive and accommodation package. They have this system down to a fine art. Boats pick up people and their luggage, fit them for dive gear and get you to the dive sites before 9 am. My top pick is Scuba Junkies, check out my review of their accommodation. 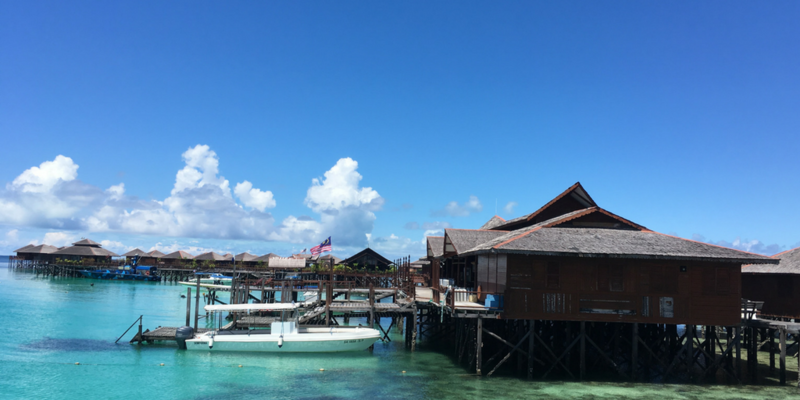 Also, read my review on the Star Mabul Lodge for why you should NOT stay there! You can easily dive in Sabah, Borneo on a budget if you do your research. 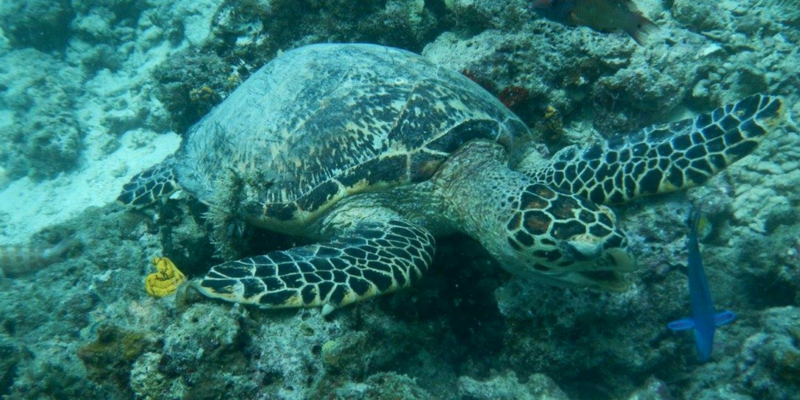 If you want to dive the famous Sipidan reef you have to book a four-day dive package. This is because the weather conditions may change, there are also limits for how many people can be on the reef every day, four days gives the dive companies more time to play with to ensure you get there. 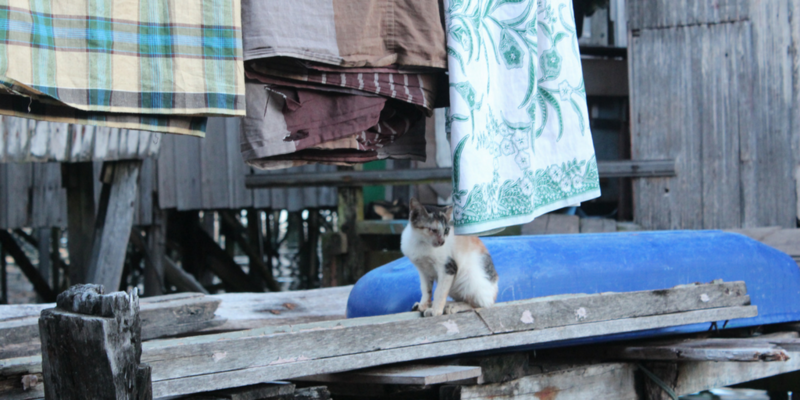 There is a lot of variety in the marine environment around Mabul. One dive might have you drifting along a reef shelf seeing eels and triggerfish. Another will be an exploration through coral formations. While my favourite dive was hopping across coral outcroppings, in between each coral section was a sandy space with much bigger fish. Oh, and everywhere you go, you will see turtles! Lots of turtles! 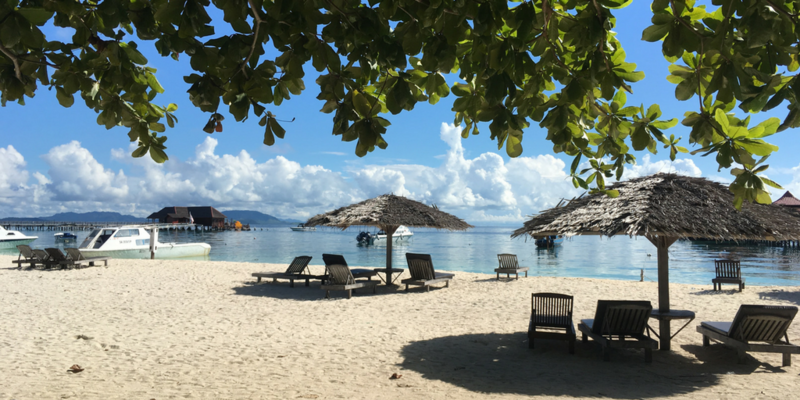 If you aren’t planning on diving Sipidan and would like to have a day off from diving, then head to one of the fantastic luxury resorts for a day of pampering… on a budget. Most of the large resorts will let walk-ins us their jetty’s if you hire a snorkel from them. We hired two snorkels between the four of us and spent the whole day on the jetty when we got too hot we just slipped into the water for a snorkel. At lunchtime we paid the equivalent of $15 to eat at their very fancy buffet – this was a bit of a let down as the particular resort we had picked catered to Chinese tourists so didn’t have much Malaysian cuisine (which has more fresh ingredients integrated into it), and there were next to no vegetarian options. My favourite part of the day was eating a chocolate Sunday ice-cream with my feet dangling in the crystal clear water for $2! You might also want to explore the rest of the island. Walking around the whole island doesn’t take more than an hour, and it is really interesting to see the fishing and gipsy villages. 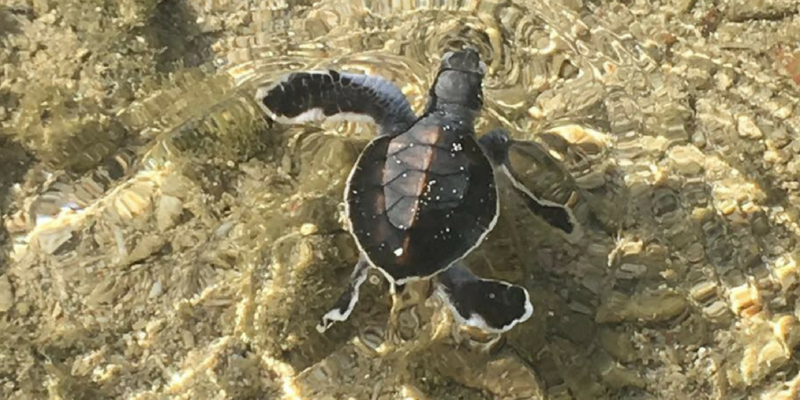 Pack in one more day of turtle spotting if you can. Or if you don’t want to do any more diving, there are some walks on other islands which you can arrange a boat to take you to through your accommodation. Leaving Mabul, is as much of an operation as arriving was. Boats quickly pack up their passengers and luggage to get you back to the mainland and in buses and taxis bound for the airport. Each round of boats is designed around the flight times, so just let your accommodation know which flight you are on and they will take care of the rest. 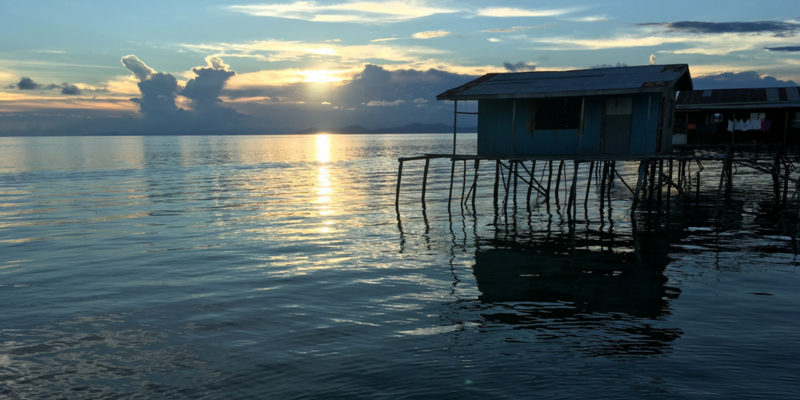 I hope this 2-week itinerary for Sabah, Borneo, helps you – and make sure you write to me and share your experiences. Is there any must see items that I missed? I really enjoyed your blog post! I am planning a trip to Borneo in June (unfortunately I can only travel during Ramadan and Hari Raya this year, but I’d really like to visit Borneo). Did you also travel in this period? Is it still possible to use public transportation or would you discourage me to visit Borneo in June? Did you manage to buy food during the day (ofcourse I will show respect for the locals and I won’t eat in public). Hi Eva – I didnt have any trouble getting around on Hari Raya, execept that everything was booked out or packed. So I would suggest booking in advance. I also had no trouble finding food during ramadan as there are a number of other cultures in Malaysia who do not celebrate this tradition. Good luck with your trip! Super round up Helen. It is SO rare to actually have something wacky aka dangerous happen. We have been in the same boat; book trip, US state department warning. Then we realize the USA likes keeping people home, and carry on LOL. I know – sometimes you really have to research the warnings to work out if they are credible to you. Thanks Ryan!